The OSCE Office in Yerevan presented a prize to Armenian Women for Health and Healthy Environment non-governmental organization (AWHHE) for their project to improve entrepreneurial skills and income generating capacities of female farmers through the use of solar fruit- and herb-drying equipment and technologies. Prime Minister Hovik Abrahamyan gave awards to twelve women entrepreneurs in the following categories: best employer, innovative entrepreneur, brand, young entrepreneur, start-up and exporter. Two winners were selected for each nomination: one from Yerevan and the other from Armenia’s region. 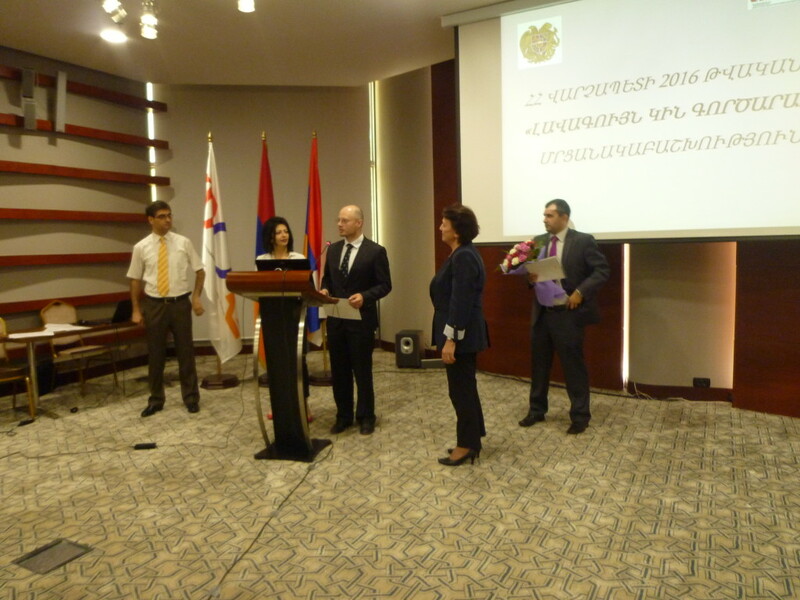 The OSCE Office in Yerevan together with other international partners presented awards to local partners that have promoted good and innovative practices through project activities. Democratization Programme Officer at the OSCE Office in Yerevan David Gullette (c) hands out a prize to Elena Manvelyan, President of the Armenian Women for Health and Healthy Environment NGO at the annual Best Women Entrepreneur for 2016 Award ceremony, Yerevan, 29 June 2016.